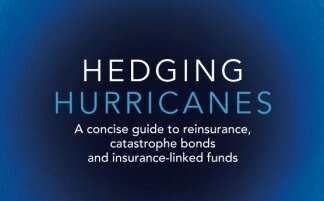 Hurricanes in the Atlantic are the cause of the world’s largest risk to insured property. Every year the risk of hurricanes starts in June and increases until the peak of activity in mid-September. But the total number of hurricanes in a season is subject to large variation – there were 15 in 2005 but only two last year. The consensus among the eight institutions that produce seasonal hurricane forecasts is that this year is going to be a quiet one. 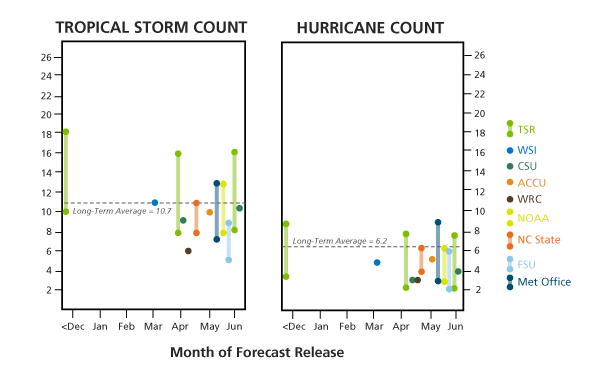 This chart from AIR shows the forecasts that had been released until the end of June. A better predictor of insurance losses is the total energy that hurricanes produce and we have charted these forecasts here. For the most part, this type of forecast is built by finding correlations between certain physical parameters and Atlantic cyclone activity. In particular, the forecasts focus on the predicted sea surface temperature in two widely separated regions. The sea temperature in the part of the Atlantic where hurricanes form is one factor that influences the activity in a hurricane season. Tropical storms are powered by warm oceans – the sea surface must be at least 26.5°C to maintain a tropical cyclone. The warmer the water in the Atlantic, the more likely it is that tropical cyclones will form and develop into hurricane-strength storms. For less direct reasons, the temperature in the Eastern Pacific has the reverse effect. Warm seas off the west coast of South America are the signature of the climatological phenomenon known as El Niño. El Niño occurs irregularly every two to seven years and has diverse effects on the weather across large parts of the planet. One of these effects is establishment of winds in the Atlantic that are able to tear apart hurricanes. So the warmer the waters in the Pacific, the fewer hurricanes are likely to form in the Atlantic. Currently most models are predicting a cool Atlantic and a warm Pacific which should both lower the number of hurricanes created and moderate the strength of each individual storm. But there are good reasons to avoid becoming complacent about the risk of large hurricanes losses in 2014. In 2013, every forecast (including the ones in August) predicted that there would be more hurricanes than the long term average of 6.3 – the actual number was two. To be useful for decision making, a forecast would not only have to have some skill in estimating the number of hurricanes but also it would have to have skill in estimating the chance of that hurricane making landfall in a densely populated area. 1992 was an unusually quiet hurricane season that produced Hurricane Andrew which was, at the time, the most expensive hurricane in history, causing losses of $25 billion after it landed in Florida as a category 5 storm. The paths that hurricanes follow are linked to a number of other phenomenon including the position of high pressure systems such as the Bermuda High which can steer hurricanes onto the East Coast of the USA. These types of weather pattern exist for periods of a few weeks and are very difficult to predict in advance. 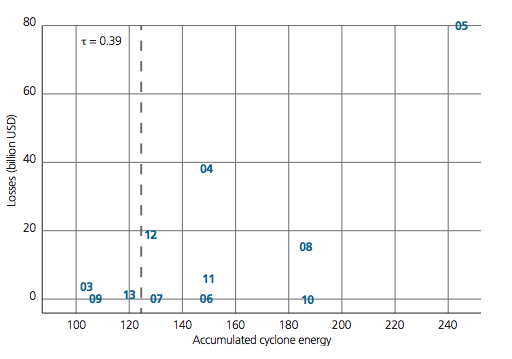 Another key finding of the study is that the total energy of a hurricane season (measured by the ACE index) is more strongly related to insurance losses than the number of hurricanes. This is no surprise as this metric incorporates both the wind speed and duration of the storm – both of which will have a direct effect on the total damage. Many other factors are important in the link between a hurricane and the damage that it causes. The physical size of the storm is one key variable that is not included in the ACE index. Dr Muir-Wood explained a few weeks ago that in storms such as Sandy (2011) a majority of the losses were related to storm surge which depends the storms size in addition to other factors, such as the tides and the shape of the ocean floor. While these seasonal forecasts are of little use to the traditional reinsurance industry there is some hope for cat bond traders who buy and sell bonds throughout the year. SCOR also looked at the skill of the August forecast and found a significant correlation between numbers of tropical cyclones and the forecasts from Colorado State University. It also found a correlation between Tropical Storm Risk’s forecast for the ACE index and insured losses. TSR August predictions of ACE versus insurance losses. Vertical dash line indicates the 2001-2013 average ACE. SCOR concluded that there is still plenty of scope for increasing the skill of seasonal forecasts. “Looking at the forecast errors since 2001, no significant improvement is visible for any of the examined forecasting schemes”.